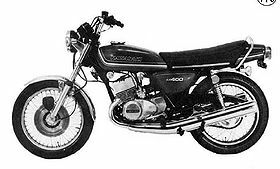 The Kawasaki KH400 was a 400cc, 2-stroke, street motorcycle manufactured by Kawasaki from 1976 through 1978. 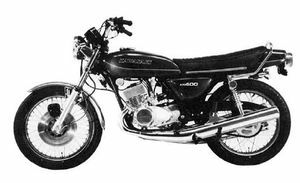 The KH400 was the successor to the Kawasaki S3. 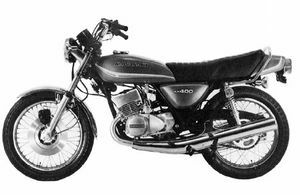 Changes between the S3 and KH400 was in the lowering of horsepower, color, markings, carburetor settings, handlebar grips, and spark plug. A CDI ignition was added as well as water-resistant brake pads, and three-fuse system adopted. Major Changes: Color, marking, seat, and brake master cylinder. This page was last edited on 21 January 2011, at 00:11.